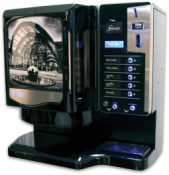 Introducing the All-New Coffee Shop Merchandiser for Flavia single serve drinks machines. 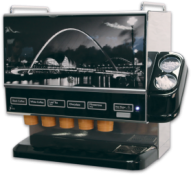 Designed to complement the launch of the new Flavia barista machine, this completely new merchandiser for drink sachets and ancillary items, is both stylish and practical. 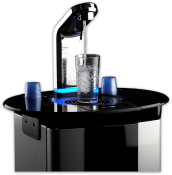 With 3 drawers for drink Freshpacks, each with 8 lanes that can accommodate 8 rails of drinks, giving a maximum capacity of 320 sachets and 24 selections. There are also 3 smaller drawers dedicated for ancillary items / condiments, plus a useful section for cup storage. Great styling including dark wood grain effect drawer panels, metallic accents and discreet concealed labelling complete the quality look and feel. 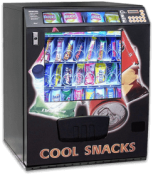 The new merchandiser packs more drinks variety in compact unit. Depth 46.89 cm, Width 45.77 cm, Height 42.93 cm and Weight (empty) 15.99 kg. 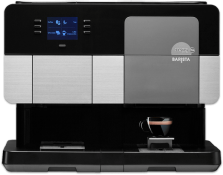 KSV supply the New Coffee Shop merchandiser free when you order a New Flavia barista machine, but it is also available to be paired with any existing Flavia machine, or can be specified as an optional extra with New Flavia Creation 400 machines.